Zhiguli at the Vorobyevy Gory in Moscow. Source: RIA Novosti. Soviet automobile exports devoured more than half of all output of domestic plants and created a shortage of cars inside the Soviet Union. In export calendars and brochures, Moskvitch and Volga car models somehow looked different and rather un-Soviet. They, unlike the majority of Soviet citizens, managed to go west. 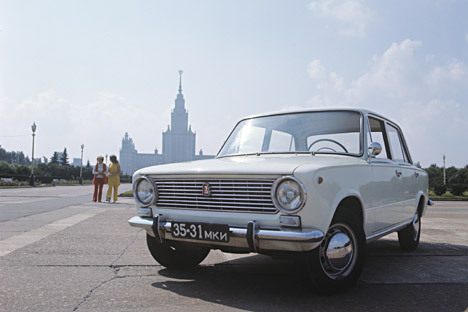 We present the stories of a few Soviet cars that "emigrated" abroad. "When I got a driver's license back in 1984, I only had £100 in my pocket. So I couldn't splash out on my first car. I looked at the column ads in the Bristol Evening Post and saw a 1973 Lada-1200 that was just affordable." This is how Stefan Floyd of the U.K. recalls his momentous purchase on http://lada1600.webs.com, a website dedicated to the production line of Togliatti’s most famous plant. Even then, buying a Lada was not that unusual. The Zhiguli brand name for the Togliatti-made vehicle had to be changed to Lada because of the former’s similarity to the word "gigolo" — a concept that was not entirely familiar to workers in the land of the Soviets. Having gone through a few more cars, Stefan eventually returned to the notorious Zhiguli (as the Lada is known in Russia); but this time his gaze settled on a more modern model — the Lada-1600, known in Russia as the VAZ-2106. The choice was intentional, as neither the Niva nor the Riva (the U.K.'s names for the VAZ-2105 and the VAZ-2107) was to his liking. He found the car in Coventry: a 1979 Lada-1600ES. For ten years it had stood in a narrow garage, impossible to get into. Stefan made up his mind right away, just by looking at the rusted front wing. He offered the seller £200 — that was very much the going rate, since it could only be topped by scrap metal collectors. He then stripped it down to "the last bolt," as if he were restoring an antique Rolls-Royce from the early 20th century. As a result, his "new" Lada turned into a beauty, and he joined the Lada Owners Club of Great Britain. Outside its homeland, the Lada often provokes a sarcastic smile. This was also the general response to the recent news that AvtoVAZ intends to return to the U.K. market. All joking aside, marketers assert that the island nation does actually suffer from a severe shortage of low-end models. Frenchman Jean-Jacques Poch was the official and only exporter of VAZ products to France. He went crazy for the 1977 Niva: "It was the world's first real SUV, inexpensive and durable. Before that, there had only been heavy military vehicles, but they weren't the real deal." Poch was one of the first to start converting Soviet jeeps (such as the Lada Niva Cabrio with a Renault diesel engine), cutting off the rear part of the roof. From 1983 through 1989, he collected more than 1,000 such jeeps. Before that, in 1978, he did up two Nivas to take part in the Paris-Dakar Rally; the teams finished 28th and 42nd. The 1980 season saw his Niva Proto take 19th place in the same rally, and the following year his Lada Poch-1800, with a 140-horsepower engine, came in third. In 1982, Poch met Marcel Morel, owner of Maurelec, who offered to install a V6 engine in the Niva — not under the hood, but inside the chassis behind the front seats! At the wheel of this monster, Jean-Claude Brivuan finished third in the Algiers Rally. In 1983, the engine capacity increased to 290 brake horsepower (bhp), and in 1986 to 310 bhp. Finally, it was furnished with carbon doors, a hood, and a trunk lid, which reduced the weight and allowed Pierre Lartigue to cruise to victory in the Tunisian Rally and fourth in the Dakar. A year later, Poch made the whole body out of carbon fiber and a roll cage, put Jacky Ickx behind the wheel, but managed only 38th place. According to rumors, Jacky Ickx owns the "carbonic" Lada Poch, while the owner of the other two rally cars is none other than Poch himself, who refuses to sell them to anyone else. He, unlike many people in Russia, never lost faith in AvtoVAZ, and zealously worked on the Lada Samara model. "Saporozhez wird ihnen Freund und Helfer sein," exclaimed an advert in the German brochure Autoexport. The Germans themselves call this set of wheels the "Taiga drum," the "T-34 de luxe," and "Brezhnev's final revenge." For electrician Jurgen Neugebauer from the German Democratic Republic, it was the only option toward becoming a car owner back in the 1970s. Back then, people had to wait years for a new Trabant and Wartburg — unless, of course, they were able to pull a few strings. In 1977, a new Zaporozhets-968M (as it was spelled in German) cost 12,000 marks. Jurgen and his wife saved for several years, each setting aside 100 marks out of their monthly wages of 500-600 marks. At last, they, like ordinary Soviet citizens, received a "postcard," informing them that their car was ready — a mere one year after applying to be put on the waiting list. An employee from the local automobile store in Brandenburg showed them to their banana-colored Zaporozhets and handed over the keys. Selecting the color was not an option under socialism: Take what is offered and be grateful. Since then, “Sapo,” as they call it, has become part of the family. After all this time, it has been taken apart once or twice, and it even had a complete body change following an accident. At club meetings, Jurgen is a real authority — who else can talk about buying spare parts through friends or replacing the front axle shaft after borrowing it from a neighbor? The idea of selling this "part of his life" is unthinkable: you cannot part with things acquired through blood, sweat, and tears. In 1952, the American magazine Motor Trend published an article about how Stanley F. Slotkin brought the Soviet car Podeda (Victory) to the U.S. from Finland. The story goes that, on business in Helsinki once, he was running late, flagged a cab, and mechanically flopped down in the back seat, only to find that the interior was rather unfamiliar. Having learned from the taxi driver that it was a Soviet Pobeda, Slotkin set out to buy one of his own. It was impossible to buy and export the model into the U.S., so what did he do? He became a smuggler, of course. The article vividly describes his long search for a car, the illicit purchase of a stolen model, the task of disassembling it into pieces and packing them into a container, followed by heart palpitations and a dry throat at customs. Why did he do it? The sole purpose was to promote and raise the price of the vehicle, which in 1952 was perhaps the only GAZ-M20 in the U.S. The idea is easily read between the lines: "Slotkin has no plans to travel in his new Pobeda; he has other cars that he prefers. Instead, he's going to make it available to charitable organizations for demonstrations. Even if he decided to drive it, it would be less than convenient having to go all the way to Gorky [Nizhny Novgorod] for spare parts. It's the only car that doesn't enjoy a six-month warranty. After the adventure of getting it out of Russia, he has no desire to send it back." In the fall of 2002, Horst Yeshe, a successful financial services employee from Frankfurt, saw a Volga GAZ-3111 for the first time in his life and immediately concocted a business plan. Here is just one fragment of an interview with this gentleman: "We decided to sell the Volga to enthusiasts who already have other cars — a Mercedes-Benz or a BMW — who just like to scare the God-fearing townsfolk with a ‘Russian tank.’ Driving past them in this beast? Oh boy!" The plan was to sell 200 cars a year, but the GAZ plant that assembled the 3111 model was literally on its knees and could only supply 10-20 units. But what about an exclusive limited series? The Volga won Yeshe over with its Russian simplicity. As he later admitted, it was completely devoid of trappings: not a single extra button or switch. The fact that cars do after all need something extra he found out the hard way. Driving back home along a German autobahn, he was tossed from side to side by his new "barge." He had to get some shock absorbers and other "accessories." Along the way, Horst gave interviews left and right, sounding off about the project and instructing GAZ managers: "Don't sell the car, sell the experience and the image. And make sure it's consistent with the vehicle... That step had not been taken. I quickly realized that you can make a car recognizable through some very simple steps. And I'm glad I found people who backed me up." According to unconfirmed reports, by 2007 he had managed to assemble seven German Volgas, not in Russia, but in a small workshop in Saarbrucken. The information cannot be verified because the last news from Horst Yeshe dates back to that year, when the model was already long out of production. As to why the project did not succeed in Russia, his reply was laconic: "It's a mess." Instead of domestic models stuffed with an automatic gearbox, many Japanese men now prefer Russian UAZ's. This is despite the facts that, in Japan, such cars cost a tidy sum and require frequent repairs. Tram operator Mitiomi Suzuki replaced his Japanese SUV with a UAZ five years ago, and he says that he never looked back. The Russian vehicle gave him what Japanese manufacturers could not: a high price combined with minimal comfort. "In modern Japanese cars, everything's too automated," he said. "Drivers will soon be redundant; but here you're really in control of the machine. I love it all: the heavy steering wheel, the gearshift, the shaking and banging of the engine." After throwing in customs duties and transportation costs, a UAZ in Japan costs about $40,000. It is that rare case when form is more important than content. "Of course, the main advantage of a UAZ is the way it looks," said the owner of Iwamoto Motors, Yuji Iwamoto. "Especially from the front, it has a very stylish shape. By design, it's very similar to Japanese cars that were produced more than 40 years ago." Every weekend, brewer Satoru Obara teaches his kids to play baseball. For many years, that was his main hobby, but recently he added another by becoming the proud owners of a UAZ. "Breakdowns do happen," he admitted. "For example, recently I couldn't get the ventilator window to close. But it's not a big deal. The car is good, I love it." Family members are sympathetic when it comes to his hobby. His wife never sits at the wheel, because driving such a car is a "man's job." The children like their unusual ride, but they would never buy such a car themselves. The upcoming generation prefers Ferrari, or, if worse comes to worst, Toyota. The owner of a Russian car needs to be not only creative, but also well-heeled. For example, to make his UAZ more noticeable, one Japanese owner invested an extra $30,000. The head of a small design firm in Osaka, Masamichi Kise, proudly states that the vehicle is the only one of its kind in Japan. It cost him a total of 5.5 million yen (about $70,000) and took six months of fine-tuning. Most of the time and effort was spent on installing an air conditioner and reworking the engine compartment, which on the UAZ is located between the front seats, and quickly overheats. "I also completely redid the passenger cabin," Masamichi said. "Replaced the seats and upholstered them with special water-repellent leather, the stuff they use to make surfers' outfits. The color was my choice. After surfing, I love sleeping, so the seat can be folded out into a real bed." Many things about this mysterious Russian car amazed its Japanese owner, including the fact that not a single bolt had been fully screwed on. But the main enigma was the inscription in red letters inside the passenger-side compartment. He asked for a Japanese translation, but the mystery remained unsolved. "I don't understand: what ring or cord do I have to pull? There's nothing here!" Masamichi said. He went on to say that he had not laughed so hard for years, as he did when he finally solved the riddle. "It turned out to be my escape route," he said, chuckling. Soon, owners of Russian cars in Japan will be very busy indeed. As of next year, tough new rules on exhaust fumes will come into force, and, without additional expenditures, most UAZ's will not pass the technical inspection.